The Raiders lost a 40-33 shootout to the Chiefs on Sunday, bringing their record to 2-10. 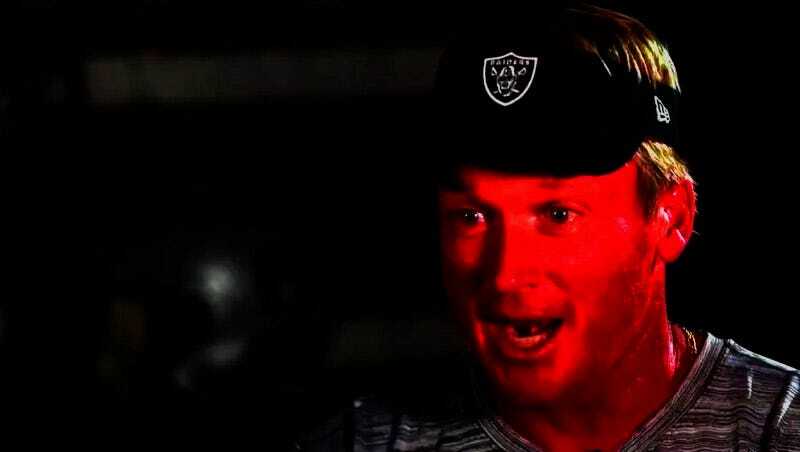 One of the game’s highlights came by way of Oakland’s Jon Gruden, who is currently doing a passable job of pretending to be an NFL head coach. Just before halftime, he challenged a Travis Kelce touchdown catch right before the Chiefs kicked the extra point. Kelce appeared to have used the ground to help complete his catch, which meant Gruden’s challenge would have been a decent one had the officials not already reviewed the play and ruled it a touchdown. Not only are all scoring plays automatically reviewed, but this play happened with seven seconds left, and all plays within the last two minutes of a half are also already automatically reviewed. Gruden cost his team a timeout for no good reason, then, although he at least got to yell a bunch of profanities at the refs. The good news is that, per his contract, Jon Gruden will have nine more years to figure out the NFL’s rules and when to throw the red flag. He should have it down by 2022 at the latest.